The 2011 Ford Fiesta after its launch on a drippy day doesn’t seem to have lived to the hype that it generated before its launch. Infact, I am yet to see even one Fiesta on the road. Now, the real reason is something which I am not too sure about. It may be that people are ready to wait for the new Verna for its much better looks and equipment levels than Ford. 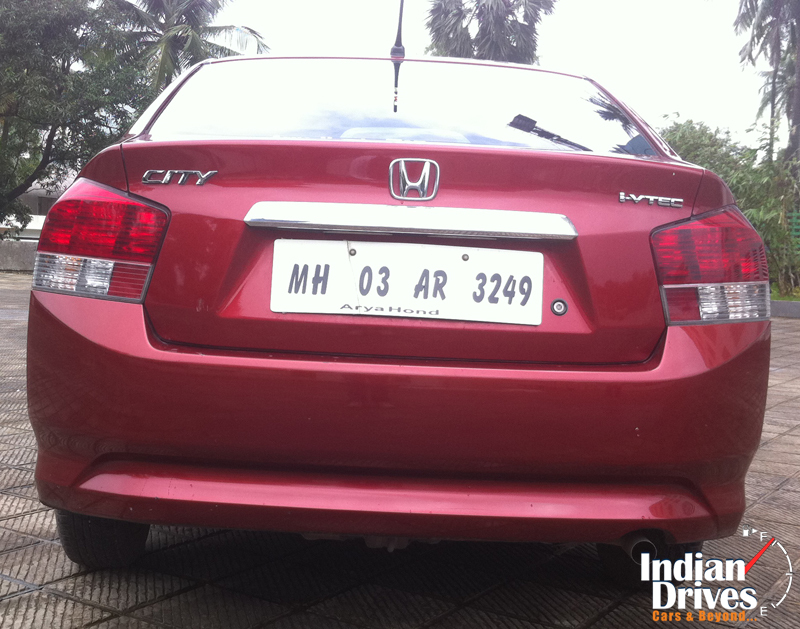 However, there is one more unforgotten car which is usually the best bet in the petrol segment. 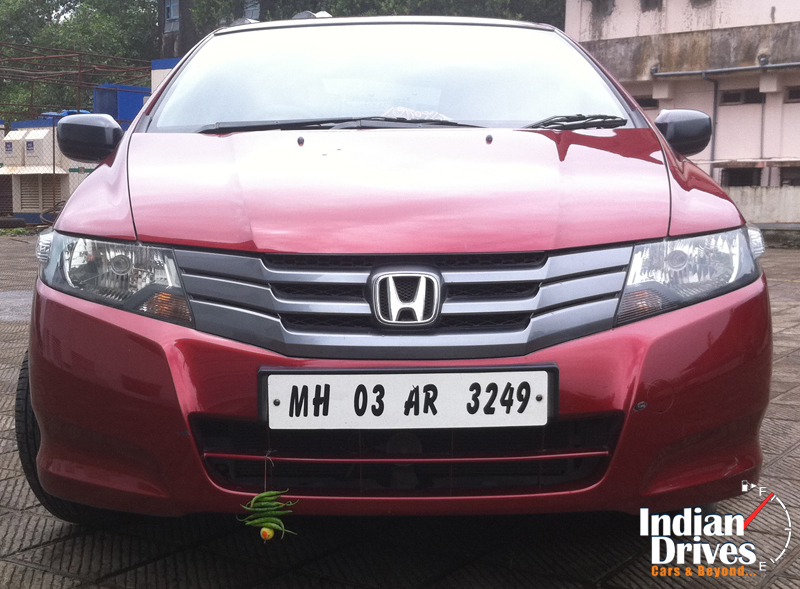 It happens to be the Honda City or ANHC. 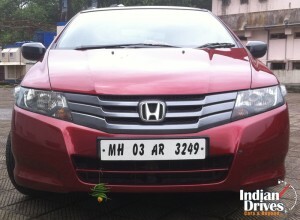 Needless to say, with its recent price cuts, sales of the Honda City have only gone up. With the Vento, however, no one is interested in the petrol variant and a close look at the Deals for the month of August 2011 would only show how VW India are keen on disposing off their petrol engined variants of the Vento, Polo and even the Phaeton. The petrol engined Verna is also a no contest in this department since most of the buyers prefer its diesel engined powerplant. 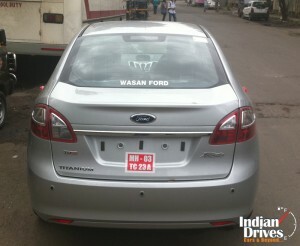 So, this leaves the 2011 Ford Fiesta in India to have a tug of war with the 2010 Honda City in India. 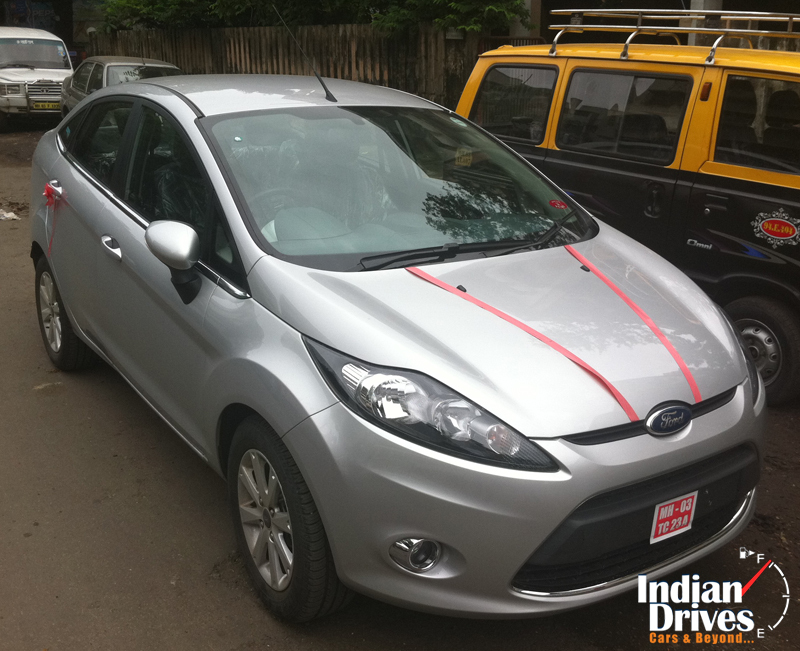 The Fiesta has a keen resemblance to the Swift Dzire. The reason is that both the cars look like they have a tacky boot job done. Yes, the Fiesta is actually a global hatch, which has got the boot job done to be accommodated as the sedan in India. Not only do does it make the Fiesta look bulbous, it also makes sure that it is not able to mask its hump well enough like what the Dzire manages to. In the same vein, the front end does tend to take on a sporty edge but then all the creativity of the Ford designers seems to have been abruptly cut towards the back. At the end, they were left with no ideas and just thought about fitting in whatever they found in their backyard. 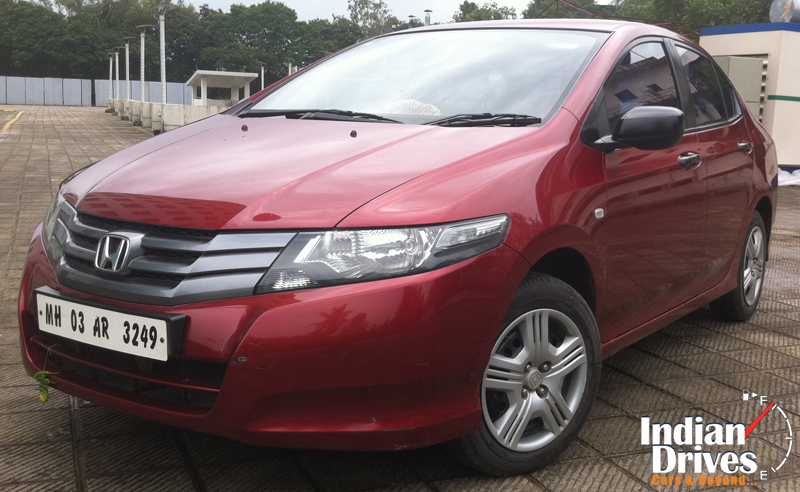 The Honda City in the meanwhile is a wholesome design which doesn’t have any time restrictions on it and seems to have been made with a proper balance to everything. Never mind that the tyres on the City look weedy and not upto the mark and initially Honda didn’t even offer alloys as an option. But the “Arrow Shot” design language certainly is a hit with both the young and old purchasers of this car. Well, for the Fiesta, like discussed earlier, I am still getting mixed opinions about its design language. From the rear, the Fiesta seems like a Toyota Prius, albeit not so aesthetically done. As for the City, the boot seems neatly integrated into the D pillar and there is much more semblance to the entire design ethos. Well, you might feel that I am a Honda fanboy, however, that’s not the case here. Infact, I hate Honda for the non value for money products that they give. Its only that the mechanicals and everything seems perfect in a Honda that I am forced to think otherwise. For the looks, I would definitely give the City a thumbs up over the Fiesta. Ideally, this is where the Ford should be trumping the City due to its goody goody interiors, however, its an all together different case. Agreed that the City’s dashboard is not to one’s liking with the cheap looking silver finish console which wouldn’t win any votes from even the blind. Also, the meter dials in the Honda look real sick with their shiny red color. But then in terms of this, the Ford Fiesta seems a leap ahead in the right direction. The plastics used seem to be of a far better quality here but fall short of the ones in the Verna. Moreover, there is more equipment here to play with, something which, if Honda were to introduce, then the base Civic and top end City would be priced similar. The steering wheel in both the cars is a nice unit to hold and features the audio controls. 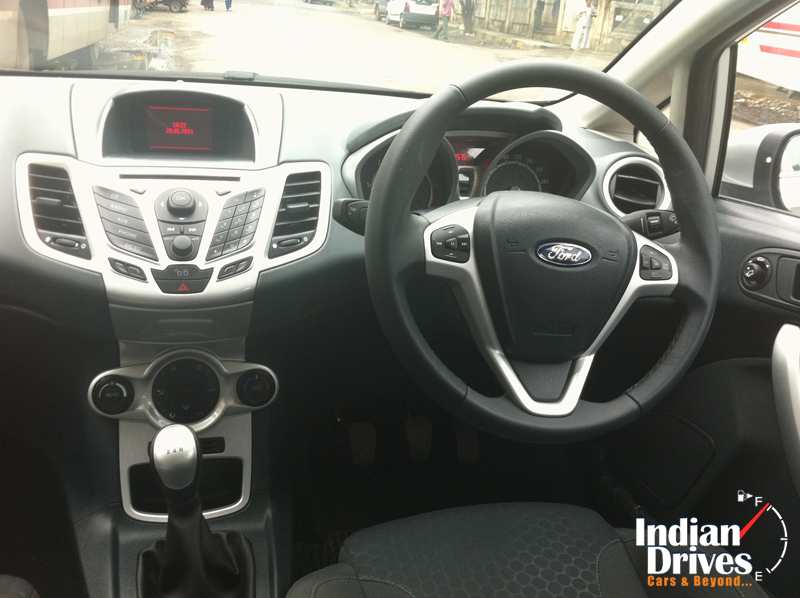 For the Fiesta, there is also the added benefit of having cruise control and also Bluetooth controls on the steering wheel. Now, this is what I would call as adding upto the value for money quotient. Between the very American styled cockpit, there is a multi information display coming up which gives various information about the distance to empty and stuff. The City also has one but then not good enough as the Fiesta’s system. Speaking of systems, Honda doesn’t provide a CD player in the City while Fiesta does it. Instead Honda provides for a USB slot in this car. Fiesta provides for both aux and USB input. The buttons in the City, however, have a slippery feel to them while the Fiesta’s have a chunky appearance to them. Electrically operated mirrors is there in both the cars while the Fiesta also has electric closing to the mirrors. The Ford Fiesta boasts of an intuitive Bluetooth mechanism which obeys audio commands and also reconfirms them before giving the desired function. The City, hell doesn’t even have a Bluetooth compatible system. Overall, the plastic quality in the City feels a bit iffy while in the Fiesta, there are a few bits and parts which feel out of place. That saying, I found the City to be a more comfortable car than the Fiesta. The Fiesta does have comfortable front seats, but then, overall in the comfort zone, it’s the City which pleased me. This coming from a 6 footer’s mouth is enough testimony to the easy going nature of the City while the Fiesta seems more driver focused with its wrap around front seats. While the quality of plastics is constant throughout the cabin of the City, the Fiesta’s plastics seem to lose their sheen towards the rear end. Was Ford thinking of selling their car with a half hearted mind or something? Seems to be the case after seeing all the happenings inside the cabin. Nevertheless, the City with its beige interiors seems cheery enough while the Fiesta with that rising shoulderline towards the rear and all black interiors seem to have a cooped in or hemmed in effect. Boot space is 430 liters for the Fiesta with no split arrangement while the City has got a very usable 506 liters of space. My vote goes for the Fiesta only for the sporty front seats and loads of equipment while the City would win my favor if it is to be chauffer driven. Ford cars are traditionally known to be good handlers as also having a pliant ride quality. The other manufacturer to get this equation right is Fiat. Where does that leave Honda? To start with, the 2010 Honda City in India has got a ground clearance of 160 mm while the Ford Fiesta is a bit jacked up at 168 mm. The City’s front overhangs are sometimes prone to scraping on the infamous speed breakers that India is known for. For the Fiesta, there is no such problem, although the ground clearance difference between both is not that much. The 2-3 times, I encountered a big speed breaker, I had to actually slow down for the City while for the Fiesta, it was sort of the confidence which the SX4 instills in a person. For the NVH factor, both the cars are evenly matched, however, my personal choice happens to be the City for its really smooth demeanor. The Fiesta had a somewhat erratic NVH thing going on for it and it may be because that the car I got for the test had barely 50 kms on the odo. It always happens that ride and handling and both on equally good fronts can never be achieved. Its more like Newton telling us that things which eventually go up also need to come down. But then defying physics is all what the auto industry is about and this time around, its Ford doing the honors. The 2011 Fiesta is based on an all new platform and this new platform is definitely one up on the one used in the City. Be it at low or elevated speeds, the Fiesta never lets the occupants know what is going on on the road. Its not that there is a problem with the electronic power steering or even the grip that this car offers, but it is just that it isolates the occupants very nicely from the road conditions. The City in the meanwhile is a bit jittery on uneven roads. As for the handling, the Ford’s chassis is more than game for any sudden maneuver and stuff. The City is also adept in changing direction but the thin weedy section of the Michelin tyres let it down. Driving the Fiesta as also the City is a no brainer thing but then while reversing, it is the Fiesta which proves a handful. Ford have plonked in an audio chirping reverse parking sensor thing but then I would have preferred the reverse camera from the Verna or am I just nitpicking here? The City offers none of this and frankly speaking, there is no need for the same as the visibility outside is not an issue in the City. The steering feel of the City is that of being typically light at light speeds and it remains the same even after the speeds have crossed the normal city ones. For an entire package, it would be the City while in isolations, it would be the Ford Fiesta. Both the cars come with a 1.5 liter engine, however, the technique used in both the cars is way different. The City comes with Honda’s fabled i-Vtec technology. This enables it to pump out 118 horses from its 1.5 liter heart and 146 Nm of torque. All this power is put down to the road via the front wheels and a 5 speed manual or auto transmission. The Fiesta 1.5 in the meanwhile gets Twin Independent Variable Camshaft Timing or Ti-VCT. This enables it to produce 108 horses and 140 Nm of torque. The 5 speed manual transmission is a gem in its operation. However, the City’s transmission feels a bit more refined and also very easier to use. The controls are light on both the cars. In the race from 0-100 kmph, I found that the City’s engine is the more eager of the two. Were it the older 1.6 liter engine in the Fiesta, it would be a delight. Though the new 1.5 liter engine is indeed good and free revving, its not in the same ballpark as the City’s. In the 0-100 kmph dash, the City has a slight edge of 1.5 seconds over the Fiesta’s timing of 13 seconds. But then the Fiesta managed to have a better top speed than the City (193 compared to 181). Both the cars come with disc in the front and drums at the rear. Both have ABS and EBD dialed in though the Ford comes with an additional advantage of traction control. Well, don’t bother much about since the Ford doesn’t make enough power to even tickle the traction control system. Twin airbags are also on offer for both the cars. What a stark contrast considering that the previous generations never offered these features as standard. ABS was not even an option on the City some time back. By the way, finally we have a car here which beats the City for its claimed fuel efficiency throne. 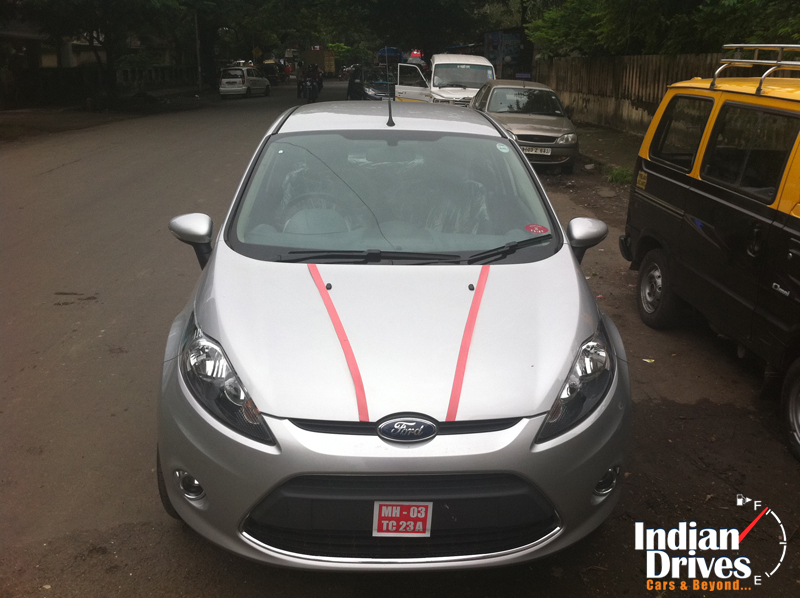 The MID on the Fiesta showed that I am averaging overall 15.2 kmpl while the one in the City showed that for the same distance and traffic conditions, I was devouring 14.8 kms per liter. MIDs can be very optimistic and hence I decided to do the tankful method for calculating fuel efficiency and it also showed the same results. So, now Ford have got a new fuel efficiency champion. Like the neutral stance that Indiandrives has recently started maintaining, here is a recap of both the cars. The Fiesta is a well rounded car and there is a pun intended in it. Its hatchback derived roots seem to be either a love it or hate it kinds. The interiors are fashionable enough but the rear seat is not so comfortable as the front one. There are many goodies to play around with in the cabin and I had a gala time playing Bluetooth Bluetooth. Apart from that, the ride and handling are also a class apart. Fuel efficiency is also very good. The servicing part is where the Honda excels. Honda cars have always being known to be extremely light on the pocket. That is only until you ding them or any part malfunctions. Just like the way its bikes also demand a premium in the spare parts department, spares for the City are very expensive. But then having a City is like marrying into a royal family. The City name is very much revered in India and resale values are ever on top eve after a liter of petrol hitting the Rs 70 mark. For the chauffer driven, look no further than the Honda City while for the self driven, it would be the Ford Fiesta. 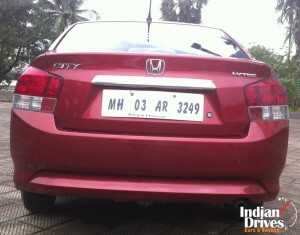 The 2010 Honda City price in India now starts from Rs 7.47 lakhs while the top end model that I tested costed Rs 9.42 lakhs. 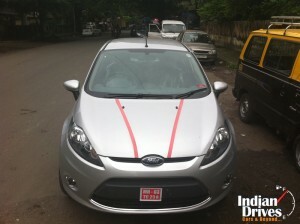 In a similar vein, the 2011 Ford Fiesta price in India starts from Rs 8.24 lakhs and goes upto Rs 10.42 lakhs. 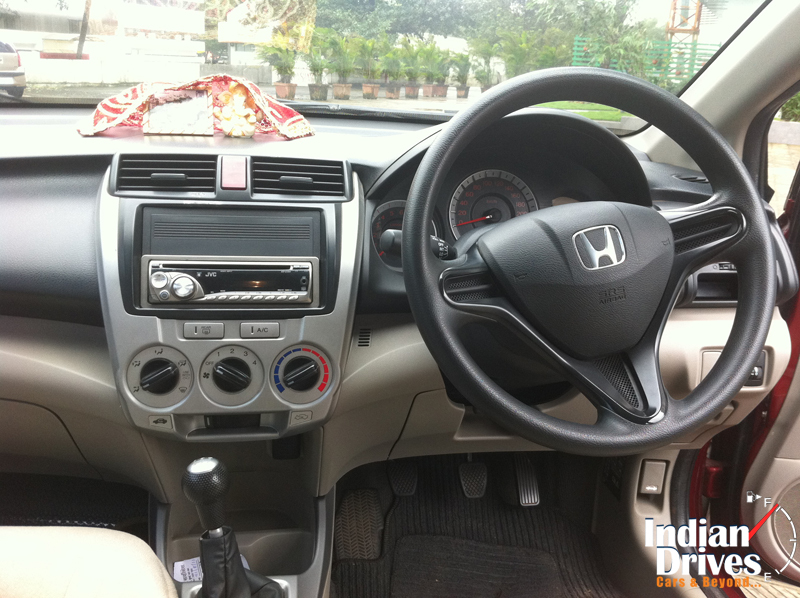 The USP of Honda is that it also offers an auto transmission for approximately Rs 80k more. Ford is yet to bring in an auto transmission to India apart from the one on the Endeavor. Only time will tell if the Ford Fiesta would outsell the Honda City. In my personal opinion, the City still stands tall and unrelenting from its C segment’s desired car position. honda city is way better than ford fiesta , cars like verna and fiesta in design and looks are good but to compare with city it takes them atleast 5 or 6 years to establish a design like city.